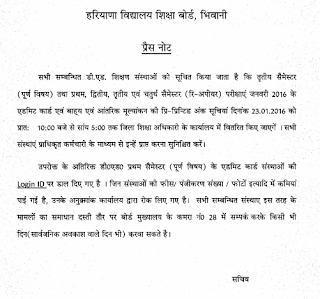 HBSE DEd Admit card 2016 released, HBSE DEd Hall tickets for JBT candidates - Board of School Education, Haryana commonly known as HBSE or BSEH is going to organize written examination for Diploma in Education or JBT classes. For that it had released D.Ed. admit cards. The written exam is to be held in January / February 2016. So admit cards for all candidates had been released. HBSE DEd Exam Admit card 2016 can be received from the following address. 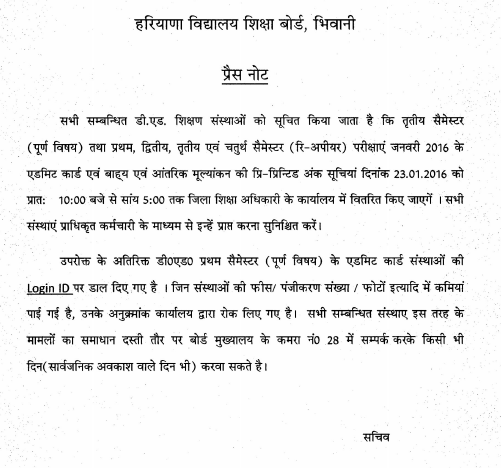 HBSE JBT Admit card will be distributed at DEO office from 10:00 am to 05:00 pm. The exam is going to be held on in January / February 2016. Also HBSE D.ed. 1st sem admit cards had been availed at the login id of the institutions. Only those whose fees is not received or registration problems, can't get them. They should contact the office.